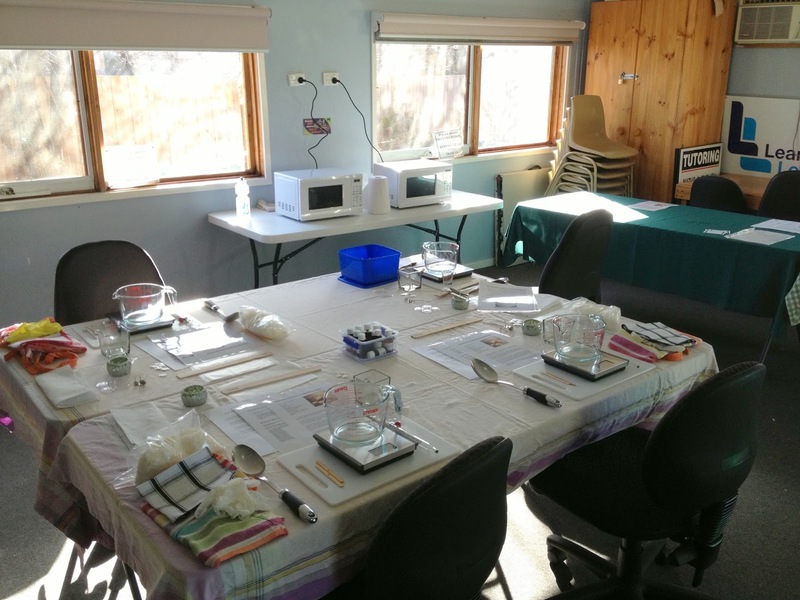 Today, Kim and I taught our first public soy candle workshop. Kim had taught a few private classes previously, however this was the first lesson with all the bells and whistles! She was the lead tutor for this class, and I was chief washer-upper. It didn’t take long to set up the student stations and one for Kim so that she could demonstrate the technique to the class. This is a close up view of a single student station. As you can see, there is everything you need to keep you occupied for a 2½ hour class. Each student made and took home a large square glass candle, a baby mosaic candle, and four tealight candles. Here are some examples of candles that Kim had made earlier, and lit for the class. Don’t they just look great? I know that I am her husband, but I think that they are amazing! A few more examples. It is a very novel use of a teacup, and to the rear right, an old salsa jar. Nice reuse, and you can make soy candles in just about any small container, as long as you have the correct sized wick. And finally, Kim’s little stall. This is where students can buy additional supplies if they need them after the class. We both enjoyed the class, as did the ladies that attended. They looked very pleased with their six candles, and walked away with big smiles on their faces. I am looking forward to Soap Making next weekend, where I will get to flex my instructional muscles. This entry was posted in Soy Candle Making. Bookmark the permalink.